Looking for a simple solution that adds extra storage and display space to your interior spaces, while remaining stylish? Look no further than our collection of shelving plans that can easily be built by you for your home. Maybe you need additional space in the kitchen, a bath, or office; whatever your need, House Plans and More has a wide variety of sizes and styles to keep your home organized and everything in its place. 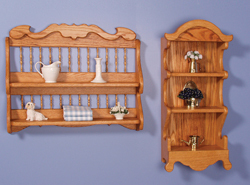 Our collection of shelving plans includes many sizes and styles to suit your home's needs. We offer detailed drawings for making this do-it-yourself project very easy. With a wide variety of plans, we are sure that you will find the perfect do-it-yourself project to fit your needs.